Across the Seine from the actual Eiffel Tower, Karl Lagerfeld erected one of his own inside the Grand Palais for today's Chanel's Fall 2017 haute couture show. If this seems a bit excessive, recall that in past seasons the designer has placed the entire globe inside the glassy Palais (well, a seven-story-high model of it), and turned the space into an enchanted forest, a bustling airport, and a supermarket, to name just a few. 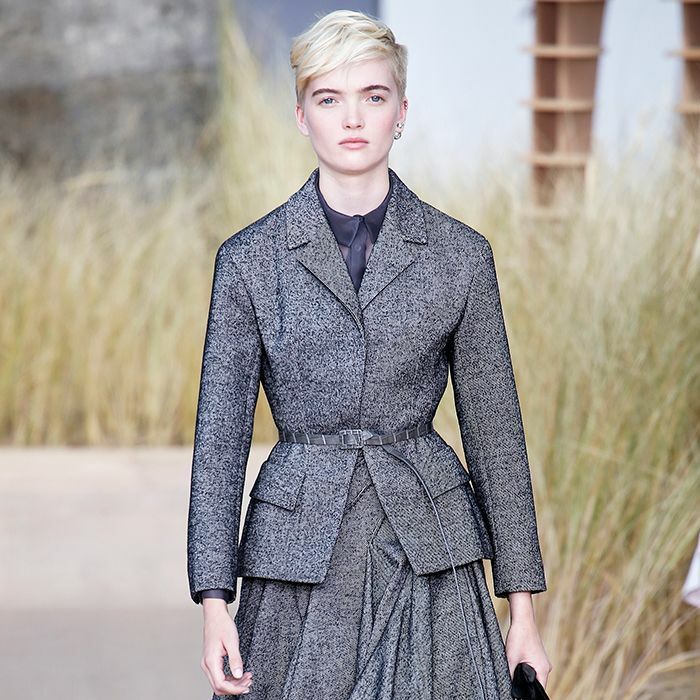 The theme of the latest collection was, of course, Paris, and in Lagerfeld's hands, this meant a long procession of the house's classic tweed suits, many with either rounded shoulders or short, layered sleeves, some adorned with feathers and others with colorful camellias. For the brand's red-carpet regulars (including front-row guests Kristen Stewart, Cara Delevingne, Julianne Moore, Katy Perry, and Lily Collins), there were dresses in sculptural black satin and billowing navy chiffon, all paired with oversized bowler hats and Technicolor eye makeup (the latter of which, at least, we'd love to see IRL). Below, see the best looks from the show—and get a peek at the incredible set. Up next, see how one It girl dresses for Paris in the summer.